Pochocuape / MMI V (Moderate shaking): I was sleeping and woke up during the quake. I felt the bed shaking. Tamarindo Costa Rica / MMI IV (Light shaking): Woke up around 3:30 am to my bed shaking, which was more than normal. Could feel the vibrations last about a min after I woke up. 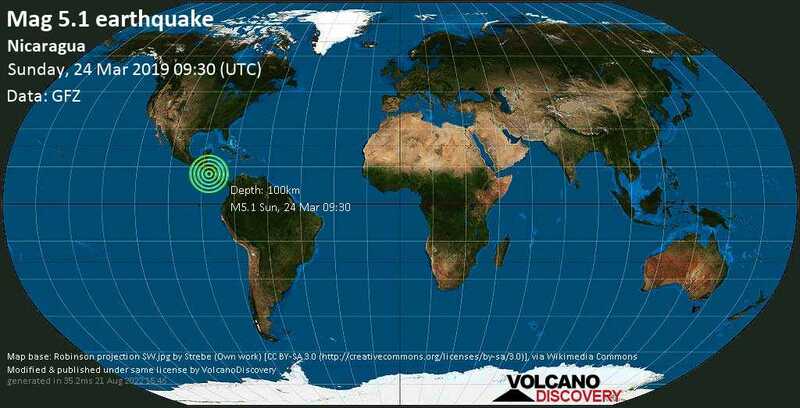 Pocohmil Nicaragua / MMI V (Moderate shaking): A short quick Jolt. Managua / MMI IV (Light shaking): First short and a few seconds later a stronger shaking. Windows rattle. Alarm of the neighbor started. Outside the birds woke up and dogs barked. A person outside mentioned that he even heard it like a strong wave.